Once upon a time a few years ago, the exact number of which is irrelevant, someone stopped on the side of the road leading from the Lindis Pass to Omarama to build a cairn. It was a simple structure, just a few rocks piled cairnishly in a roundish heap. Sometime later some other body saw it, stopped and built another one. Some other bodies kept seeing and stopping and building and now the cairns are dotted along the road side for more than seven kilometres. Cairn building isn’t just spreading along this stretch of road. Rocky, roadside art is breaking out in other places too. There are a couple more on the straight between Tarras and the Lindis and cairn building has spread to the North Island too. 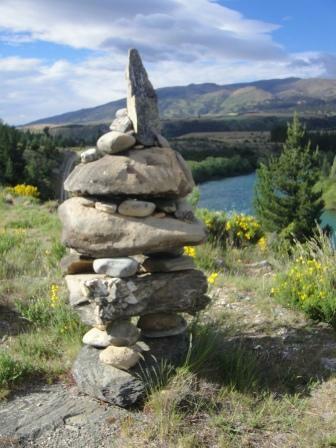 Finn Howell has built 23 cairns along the Hutt River since September. 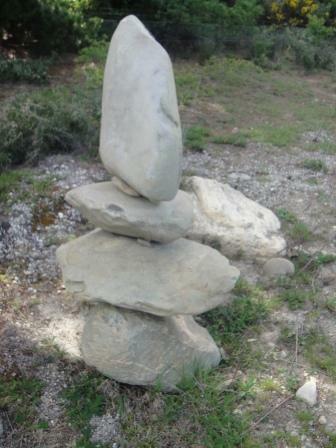 His work has inspired another 15 cairn builders to leave their mark in stone. PM of NZ wonders how long it will be before someone spoils the fun with good reason. Robert Guyton has several photos like this of one of several driftwood sculptures in the Riverton estuary which attracted the attention and ire of people with too little to do. I hope these cairns don’t run foul of someone with a clip board. I like the random rural roadside art and hope the cairn builders will be able to carry on building cairns happily ever after. This entry was posted on Sunday, November 14th, 2010 at 9:00 am and is filed under Art, rural. You can follow any responses to this entry through the RSS 2.0 feed. You can leave a response, or trackback from your own site. When you say you hope these cairns don’t run foul of someone with a clipboard, are you seeing a bureaucrat underneath a pile of rocks? I guess they have become ‘victims’ of urbanisation and now live in high-rise apartments. Robert – you never know where a bureaucrat might be. The geckos, skinks, beetles et al may have a different view but I think there’s still plenty of rocks left for them. Fred – they may even enjoy the views. Ele – each rock already has it’s resident population, so I take it you are in favour of double-bunking. Perhaps you share Julia Gillards plans for a refugee processing centre? 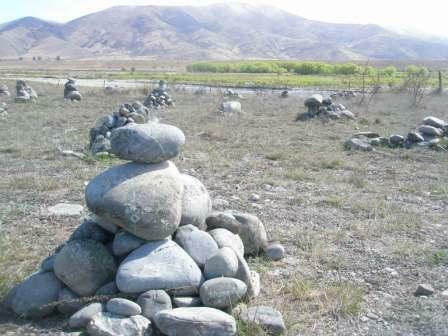 btw – in Southland, we call them ‘cairns’ but that’s probably some dialectical abberation. You know what we’re like, with our rollin’ arse ‘n all. I’ll leave the bunking arrangements to the bugs. As for carins – they could be places for carin’ for the wee critters you’re worried about or just what happens when you type fast and don’t proof read. I’ve corrected it, thanks.